What cool, yet unconventional, home additions can homeowners and real estate investors add for additional appeal to their property? Adding the right improvements can result in huge profits for any investor. Home additions and improvements are constantly a source of controversy in the real estate community. Green real estate investors and regular homeowners frequently and mistakenly believe that the improvement ideas they have will automatically add value to their properties. Unfortunately, while many of these upgrades may make the property look nicer and increase a perceived value, they do little to actually boost the price. Many times, newbies put tons of cash into home additions that never produce a positive return. It takes extensive knowledge of the real estate industry and local home values to make the right improvements and generate a profit. Decks, additional bedrooms, new landscaping, and staging can all be good moves. But what creative additions are there to consider that may really be exciting and rewarding to work on? 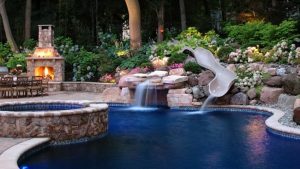 Done right, a swimming pool with great landscaping can be the selling feature that stands out and gets a home sold, regardless of what the rest looks like. Americans are more stressed out than ever and want their home to be a retreat where they can get away from it all. So what about a rooftop Zen garden, sauna or yoga studio? Home offices have been pegged as one of the most important room additions today. However, with more individuals working from home and home schooling become a bigger trend, buyers want bigger home offices that are already for them to switch on and get to it.